Death of Monopoly: SDJ 2010 nominee? Okay, maybe it's a bit early to speculate about next year's Spiel des Jahres nominees (this year's happened two months ago) but I sure think we played one last night. 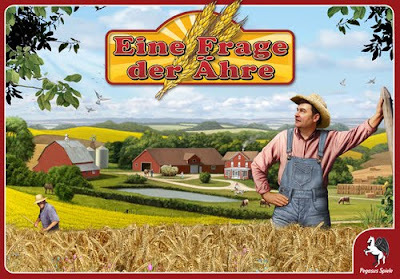 After reading a positive review on Gamepack about Eine Frage Der Ahre, I decided to grab a copy. The game is a tile-laying Euro about farming and it feels a bit like Ingenious meets Ticket to Ride meets I don't know (some say it is similar to Taluva, which I have yet to play). It's extraordinarily well-balanced, the rules are simple, and in our first game last night the top two players took very different strategies and we still ended up having to determine the winner on a tie-breaker. Everyone agreed it was great fun and was looking forward to playing this beautifully produced game again. "Mom, I think she broke Ticket To Ride...."
Ticket to Ride World Championship! "Are you THAT Eric Martin?!?!?"